For a week-end or more ! With an amazing view on the park, due west, you will be able to enjoy some nice sunsets, with the sun reflecting on the pond, and the Amboise castle reflecting on the Loire river. Peace and quiet are keys : no cars will disturb your sleep and your well deserved rest. Early in the morning, you may see some squirrels chasing each other on the lawn or in the trees of the beautiful and vast property. 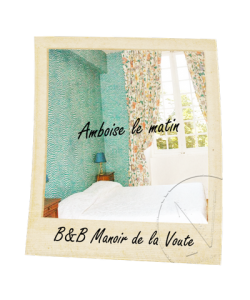 This B&B of 18 square meters can welcome 3 people (quite often a couple with their child). It features a double bed (160X200), and a single bed (80X190). The earthenware bathroom, that includes a bath tub and toilets, is really bright thanks to a big window. The floor in the bedroom is made of ancient parquet. The one in the bathroom has been renovated. The exposed beams are obviously not lacking, and the cob walls make the room really attractive. The ancient pieces of furniture are also adding to the charm of the room, especially a beautiful wardrobe in Louis XIV style. The Amboise bedroom is one of the preferred bedrooms of the manor ! High season : from 2017/07/01 to 2017/09/03 and Week-Ends of May, Pentecost, Christmas holiday, French spring holiday and All Saints’ Day.